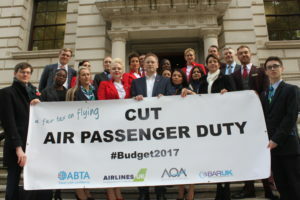 The A Fair Tax on Flying Campaign turned out in force in Westminster on Tuesday (7 November 2017) to press the call for a significant cut in Air Passenger Duty (APD) in the forthcoming Budget. Representatives of Airlines UK, the AOA, BAR-UK, ABTA, Virgin Atlantic, American Airlines and Bristol Airport supported the Rt Hon Grant Shapps MP as he hand-delivered a letter to HM Treasury. The letter, signed by over 40 members of the British Infrastructure Group of MPs and Peers that Mr Shapps chairs, highlighted the damaging impact of the high level of APD on trade and connectivity and called for a decisive cut in the tax. Later in the morning, representatives of the campaign delivered a petitioning letter to the door of Number 10, urging the Prime Minister to act on APD. Henk van Klaveren, spokesperson for the A Fair Tax on Flying Campaign said, ‘Harnessing the support of MPs and Peers is a vital part of our campaigning work to secure a cut of at least 50% in APD. We’re grateful to Grant Shapps for his high-profile support and to the growing list of MPs now listed as supporters on our campaign website. The whole economy needs an APD cut of at least 50% to get us on a level playing field with the next highest aviation tax country in the EU, Germany’.